Emily Harrell, P.E., CPESC, began serving as Lakeland's City Engineer in November 2015. Prior to that, she was a Lakeland staff engineer for six years before taking a job in 2014 as a senior civil engineer in Collierville. Emily oversees the Engineering Department which is responsible for all public infrastructure (roads, drainage, sanitary sewer, etc.) including new development and maintenance of existing facilities. The Engineering Department includes Construction Inspection, Public Works, and Wastewater Departments. 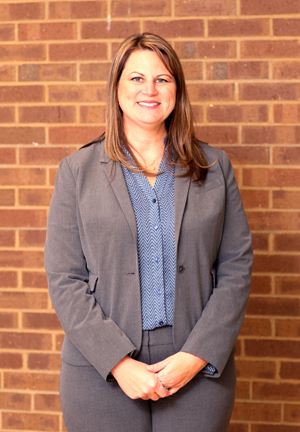 In addition to managing these departments, Emily reviews development plans, oversees capital improvement projects, and ensures compliance with the TN Department of Environment and Conservation Wastewater and Stormwater Permits. In May 2017, Emily was named Outstanding Government Engineer by the West Tennessee Branch of the American Society of Civil Engineers. In recognizing Mrs. Harrell, the award committee noted: “She has done a great job of providing engineering services to Lakeland’s residents while ensuring that they coordinate with other jurisdictions for better results and cost savings." Emily also serves as the City of Lakeland's ADA (Americans with Disabilities Act) Coordinator. Emily is a University of Memphis graduate. She and her husband Keith are Lakeland residents and have a son, Blake.